The post Dogs in Heat: 9 Things to Know by Jackie Brown appeared first on Dogster. Copying over entire articles infringes on copyright laws. You may not be aware of it, but all of these articles were assigned, contracted and paid for, so they aren’t considered public domain. However, we appreciate that you like the article and would love it if you continued sharing just the first paragraph of an article, then linking out to the rest of the piece on Dogster.com. Do dogs have periods? Not the same way that female humans do. Female dogs who aren’t spayed go into heat and the amount of time a female dog bleeds and when she’s fertile varies greatly from a human menstrual cycle. Let’s discuss some facts about dogs in heat — and why it’s important to spay your female dog! 1. A dog heat cycle only happens once or twice a year. Do you know these important facts about dogs in heat? Photography ©Cynoclub | Thinkstock. The canine estrus cycle (commonly referred to as the dog heat cycle) occurs every 6 to 12 months. 2. A puppy can go into heat sooner than you think. The earliest that most dogs will experience their first heat cycle is at 6 months of age. 3. Dogs in heat should stay away from intact male dogs for 3 to 4 weeks. This means that dogs in heat should not visit dog parks or do any doggie day care visits. “Anytime a dog is in heat, assume it’s going to be at least a month and keep them away from male dogs during that time,” says Nancy Kelso, DVM, medical director at VCA Columbia Animal Hospital at Hickory Ridge in Columbia, Maryland. “Generally, neutered males are fine, however, it’s also stressful for intact males to live in the same house as a female in heat so we usually recommend totally separating them.” If possible, send one of the dogs to stay with a relative or friend for a month or so. 4. Don’t think you’re in the clear once the bleeding stops. Dog pants, like this fun polka-dot option from Glenndarcy, are great for dogs in heat. Photography courtesy of Glenndarcy. 5. The bleeding from dogs in heat isn’t as bad as you might think. “Fortunately, in most dogs it’s not a large amount, it’s relatively small,” Dr. Kelso explains. 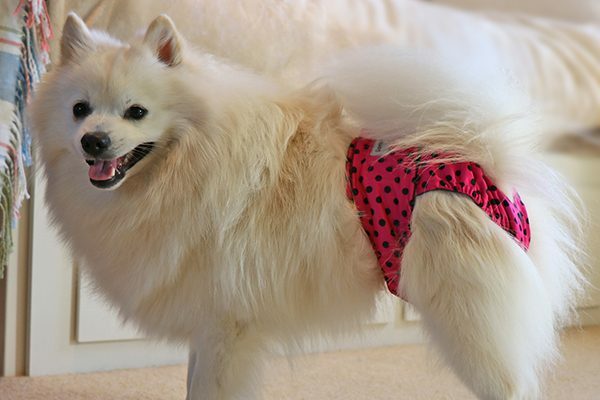 “Some people will use sanitary diapers for dogs.” With some dogs in heat, you won’t really notice the bleeding. 6. Don’t delay scheduling your dog’s spay. 7. Spaying your dog decreases her chances of developing mammary cancer. Mammary cancer is the equivalent of breast cancer in dogs. 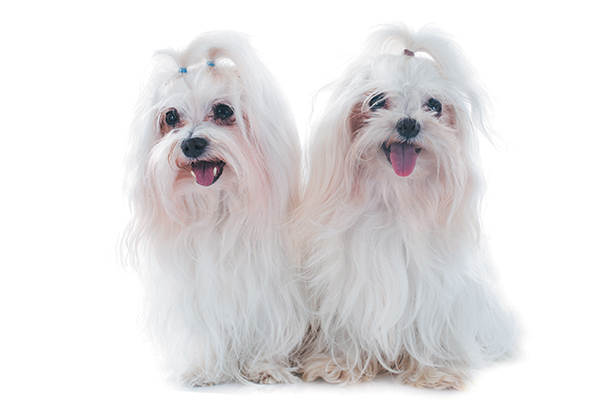 Check your female pup regularly for lumps in her breast tissue (from her armpit to her groin). If you feel something suspicious, schedule an appointment with your vet. 8. Pyometra is another danger for female dogs who aren’t spayed. 9. Dogs in heat know when they are in heat and fertile — and when they are not. Thumbnail: Photography by Claudio alexandre Cologni/Thinkstock. Serving all of Michigan: Holland, West Olive, Saugatuck, Hamilton, Kalamazoo, Fennville, Douglas, Grand Rapids, Grandville, Hudsonville, Walker, Cascade, Grand Haven, Spring Lake, Fruitport, Nunica, Fremont, Muskegon, Whitehall, Montague, Lansing, Lapeer, Saginaw, Bay City, Flint, Lansing, Troy, Detroit, Ann Arbor, Rochester Hills, Grand Blanc, Farmington Hills, Sterling Heights, Warren, Sandusky, Marlette, Croswell, Imlay City, Pontiac, Frankenmuth, Almont, Metamora, Royal Oak, and Auburn Hills. Specializing in: Providing dog training services such as obedience, aggressive behavior modification, and personal protection. Copyright © 2011 K9 Specialist. All Rights Reserved.